Given how little good news Yahoo has had to share with investors lately it’s no surprise that the company is trumpeting the results of Sunday’s first-ever globally live-streamed regular season NFL game, between the Buffalo Bills and Jacksonville Jaguars, which attracted 15.2 million unique viewers and 33.6 million total views. Those numbers make it one of the biggest live-streamed events to date, and compare favorably with the TV audience for a typically Thursday night or Monday night regular season game, according to the NFL. Yet as others have pointed out, the reported numbers don’t tell the whole story. Yahoo had to resort to some trick plays to score some of those points, like putting a muted auto-play video of the game on the home pages of several of its properties, which means your Aunt Minnie, who has never watched an NFL game in her life but uses Yahoo as her personal home page, is somewhere in that 15 million. The comparison with broadcast TV viewership is also overstated. As Brian Stetler of CNN pointed out, the 460 million total minutes of football Yahoo claims to have streamed, over the course of a 195-minute game, implies an average of just 2.36 million concurrent viewers, the streaming metric most comparable to TV ratings. Neither the corporate spin, nor the debunking really matter, however, because raw viewership was not what was on the line on Sunday, except in the most indirect sense. For Yahoo, the game was an opportunity to showcase its live-streaming chops as it searches for some way to remain relevant as a platform to both advertisers and rights owners. And on that score, Yahoo largely delivered. Apart from a few problems with the stream in the early minutes of the game, Yahoo by most reports delivered a high-quality picture, with little or no buffering or freezing in 180 different countries. Yahoo did offer viewership guarantees to advertisers for the game, but those guarantees were low enough that meeting them was never really in doubt. According to AdAge, the 15.2 million unique viewers Yahoo delivered were more than four times the guarantees. AdAge also reports that Yahoo had to slash its initial asking price for 30-second spots to sell-0ut its inventory, and most of the top NFL advertisers stayed on the sidelines, but even if it didn’t make a profit on the $20 it paid the NFL for the rights, Yahoo arguably did what it needed to do with the game. As for the NFL, it’s doubtful anyone there believes or even wants streaming to replace linear TV as its main broadcast platform in the U.S. in the near or medium term. As discussed in a post here last week, the NFL has a lot to protect in the current pay-TV bundle and no reason to accelerate its unraveling. But if the league is paying attention it also probably realizes we’re at or near peak-NFL football in the U.S. and that growth is going to be harder to come by here in the future. NFL football is already the most expensive programming on TV, and commands the highest advertising rates. But both the TV audience and TV industry are certain to look far different from today when the NFL’s current U.S. broadcast deal comes up in 2022. Given the likely erosion in both linear TV viewing and pay-TV subscriptions between now and then, to say nothing of possible regulatory and legal changes that could affect the league and its broadcast partners, matching, let alone exceeding the $27 billion CBS, NBC and Fox agreed to pay in 2013 for another eight years could be a very tough first down. Streaming more games into more markets on a pay-per-view or subscription basis would probably generate more revenue than the NFL’s current deal with DirecTV for Sunday Ticket, but would also likely make the broadcasters even more reluctant to top their last offer. Expansion might be another option for growth, but more teams would be more games and a longer season, adding to the already brutal toll the game takes on the players. 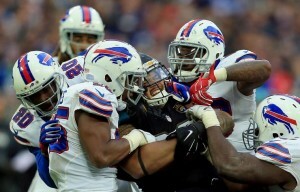 It’s no accident the Bills-Jaguars game was played in London, at a time suitable for a global audience. If the NFL wants to find running room after 2022 it will likely have to look overseas. From that perspective, the NFL has to be thrilled that 33 percent of the views on Sunday came from outside the U.S. Developing an international audience for American football will be a long-term project. The closest model for what the NFL is trying to do might be the English Premier League, which has built itself into a major global brand over the past decade and now commands huge fees for broadcast rights in territories outside the U.K., including in the U.S., where NBC ante’d up $1 billion in August for broadcast and streaming rights to all league games through the 2021-22 season. Unlike the EPL, which could at least leverage the global popularity and familiarity with soccer to build a fan base and interest local broadcasters, the NFL will need to do a fair amount of spade work to prepare the ground outside the U.S. and perhaps a few other English-speaking territories. Streaming is likely to play a critical role in building a global audience for American football before the NFL can reasonably look to sell in-market broadcast rights beyond one-offs like the Wembley contest between the Bills and Jaguars, let alone start planting expansion leagues — likely the NFL’s ultimate goal — outside the U.S. 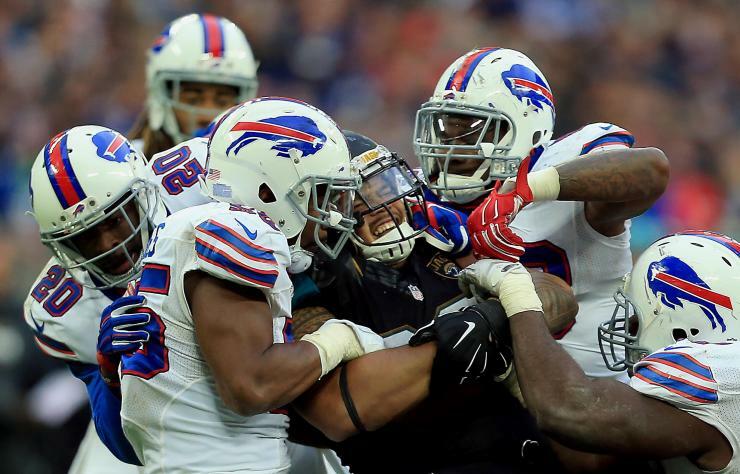 The Bills-Jaguars game was no more than shakedown cruise for staging a global streaming event around an American football game. Yahoo appears to have passed the first test, but it was only the first of what will likely be many and if I were Yahoo I wouldn’t be thinking I had an inside track for the future. The NFL is simply starting to audition potential global OTT broadcast partners and there are others who will be very keen to get into that game. With So Many Americans Dropping Cable, Will Cord Cutting Doom TV as We Know It?